This real life analogy demonstrates what can happen when we fail to plan and make goals for our blogs. Without these essentials in place, we will succumb to discouragement when prevailing conditions go against us. Quite often resulting in yet another blogging shipwreck. 3 ways to avoid blogging shipwreck. 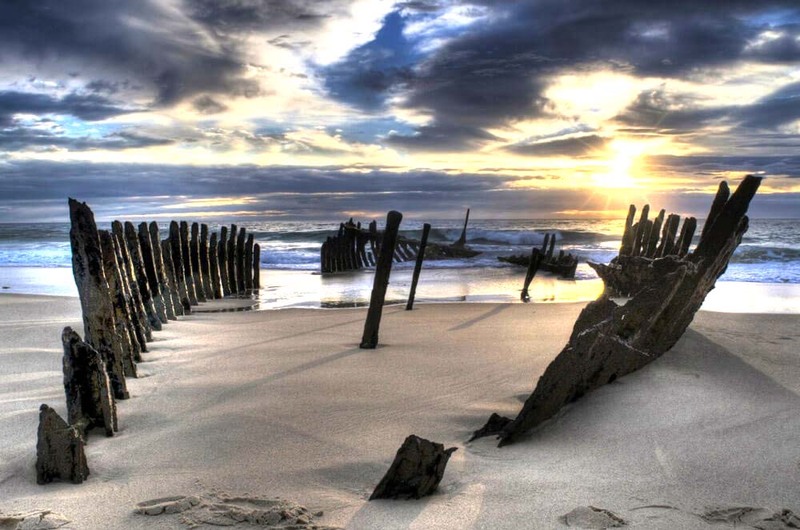 For over 120 years, the wreck stuck in the beach has been a tourist attraction and point of interest. Recently it was declared to be a danger to the public, and the decision was made to remove the visible parts of the wreck. It was sad to see it go, archeologists were called in to oversee the removal of the decaying parts. 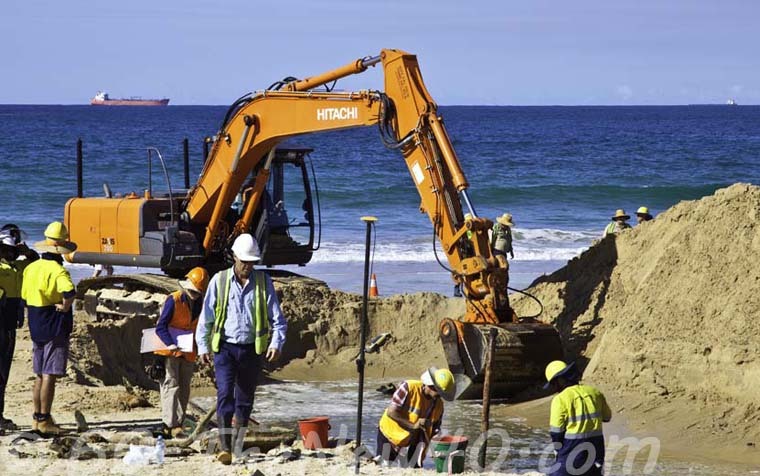 They work at removing the 122-year-old remains of SS Dicky, the ship that was unable to find its destination. In stark contrast, a modern container ship is seen in the background, aided by modern technology, heading for its destination. This quote and the story of the shipwreck reminds me of Blogging Goals. Thousands if not millions of people start blogs with varying degrees of enthusiasm. Many are determined to make a go of it and even make a living or supplement their income from blog revenue. Sad to say, after the initial enthusiasm wears thin and the realization that blogging is hard, time-consuming work, the majority give up. They end up as a casualty like the SS Dicky whose captain did not pay due attention to his plans to reach the goal, the destination. 1. Have a right, balanced estimation of your abilities. You start your blog, and you would like to reach a successful destination as quickly as possible. Unless you have plenty of money to outsource a lot of tasks, you will have to take the time to learn some technical stuff to run a website. Learning a step at a time, it is not that hard. Be kind to yourself and give yourself time to learn as you go. When you first start blogging and even for those who have been blogging for some time, there is a steep learning curve. Look for help and ask for help. Don’t expect too much in a short time. Realizing that you are building upon your abilities and that it takes time, is one of the ways to avoid blogging shipwreck. It can all be overwhelming, suddenly your inbox is full every morning, often from places where you have sought some help on a particular subject. You joined some social media groups, and they are also sending you emails. You make comments on blogs, and that can bring more emails. You join blog parties, more emails. etc. etc. You want to write a new post and get it published. You know you need to spend time making some structural improvements to your website. Or you realize that what you enjoy writing about is different now than when you started blogging. This change happened to me at least twice in the first four months of blogging. I thought that my thing was going to be blogging about budgeting. It is a subject that I practice daily, so I know the ins and outs of budgeting. But I found that I did not enjoy writing about budgets. So the tagline and structure for my site changed several times. Prioritize the changes you want to make and go ahead and change it. The sooner you find what you love to share and write about the better, but don’t be afraid to change. These tasks all add up to being a lot of work to maintain a good blog. Prioritize the work and get it done one step at a time. Make a plan, a priority list either on your computer, a calendar, or pen and notepad. Work on recording your short-term goals and make sure they are in line with your long-term goals. One of my downfalls is looking in the email box first thing in the morning. I open an email, and somehow it leads me off, it may be to social media and then I get caught up doing good things on social media. Good things, but it is not getting the things done that must be done today. To remedy this take a quick look down the emails and only open anything that looks urgent. Then go right back to your must do list. Crossing things off that list will give you new energy and a feeling of accomplishment. Have trouble prioritizing, or procrastinating. 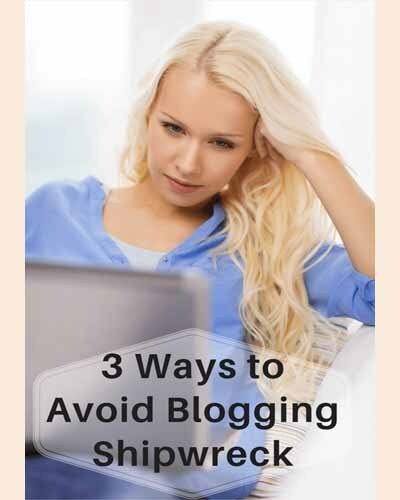 I have a review of a wonderful little book that will help you so much and could be one of the ways to avoid blogging shipwreck. Eat That Frog! 21 Great Ways to Stop Procrastinating and Get More Done in Less Time. By Brian Tracy. The principles make for more emphasis on the family, LESS stress and a greater sense of accomplishment and WELL BEING. Read our book review. Another of the ways to avoid blogging shipwreck is to check your progress. Look at where you started and look at where you are at now. There are several ways to do this. In the beginning or even if you are well along the way make a note of these things. To grow your blog, social media is essential. Three or four is enough to start with; you don’t want it to consume too much valuable time. Make a note of how many Followers or Page Likes that you have now. (Some social media platforms have their own analytics.) Check these numbers at the end of each month to see the growth. Do you need to learn some growth strategies? One way to grow and find help is to join social media groups. Some groups are very large and can be a bit intimidating while others are small enough that you will be noticed. One group on Facebook I know is very friendly and helpful is at Debbie in Shape Friends Just click on the Join tab. The best way to do this is to get Google Analytics. If you are not sure how to go about this, don’t worry, take it step by step. Read this post – Google Analytics for Beginners for direction and help. Being serious about growing your blog it is a must to know how many people are visiting your site. Which pages are they reading? Do they stay and continue to read other pages? How long do they stay on the site? Where do they come from? Do past readers return? Am I getting new readers? All of these questions and more are answered with Google Analytics. To check your progress keep a record of where you are at now and check it at the end of each month. A word of caution, some check analytics every day, just be aware that statistics will go up and down. Please don’t let these statistics ruin your day. Take what you can from them and set goals to improve. That is how we learn and push ourselves to do better, to keep moving forward. When you can look back on your progress, you will be encouraged and continue toward your long-term goals. You will not fall apart and give-in. Your progress will give you the energy and ways to avoid blogging shipwreck. Blogging Goals – Work on recording your short-term goals and make sure they are in line with your long-term goals. What ways have you found to keep motivated and on track? Hi Regina, I do love the way you put that about the email train. That is so good, I must remember that one. these are great tips Kathleen – I think balance is really important and also how effectively you use your time. If something is time consuming and not helping your blog, then it’s time to try something new. I am very committed to my blog not becoming a chore – I want to smile while I’m online! Thanks Leanne. It would just not be the same without your beautiful smile so keep doing what you’re doing. Thank you for these wonderful easy to understand tips Kathleen! I am so excited that I was able t add google analytics per your detailed instructions! I know this is gong to help me in understanding the activity on my site and my readers/community interests. I know it will help me. Thank you again for sharing this information. have a wonderful and may God bless you and yours!. Hello Horace, You made my day, I just love to be able to help people. You will find the analytics helpful, being able to see what pages your readers go to and which pages are the most read etc, is very good. Thank you for taking time to comment and the Lord bless you too. You make awesome points here. All three things are so important. Checking my progress on for page views has encouraged me. When I look at where I was 6 months ago to today 🙂 Thanks for sharing your ideas on how to avoid blogging shipwreck! I’m stopping by from #OverTheMoon. Such great tips Kathleen! I need to remind myself again. Pinned and shared. Thanks for linking up at #OverTheMoon! I hope you will join me at #Wonderful Wednesday. Next post Eat That Frog!